It’s been about a month since we last checked in on the their master bedroom space we’re working on. 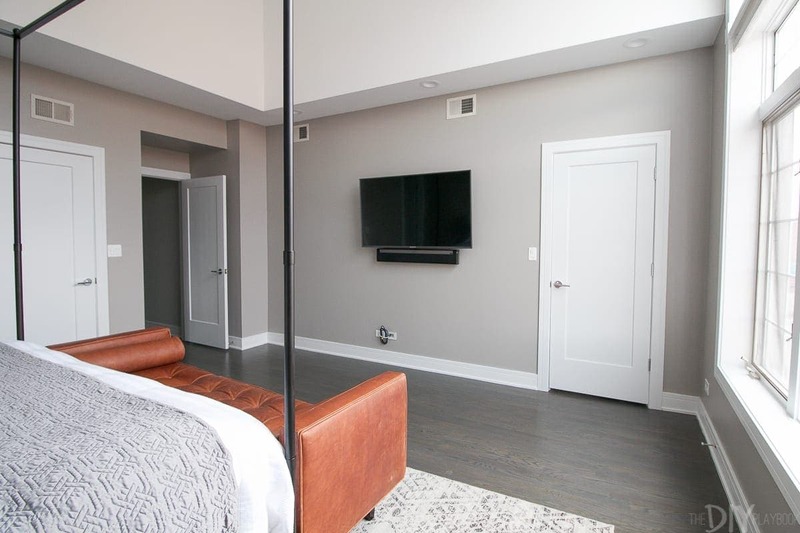 If you remember, Casey’s brother and his girlfriend recently bought a large condo in the Wicker Park neighborhood of Chicago. It’s a gorgeous home, with lots of modern touches. 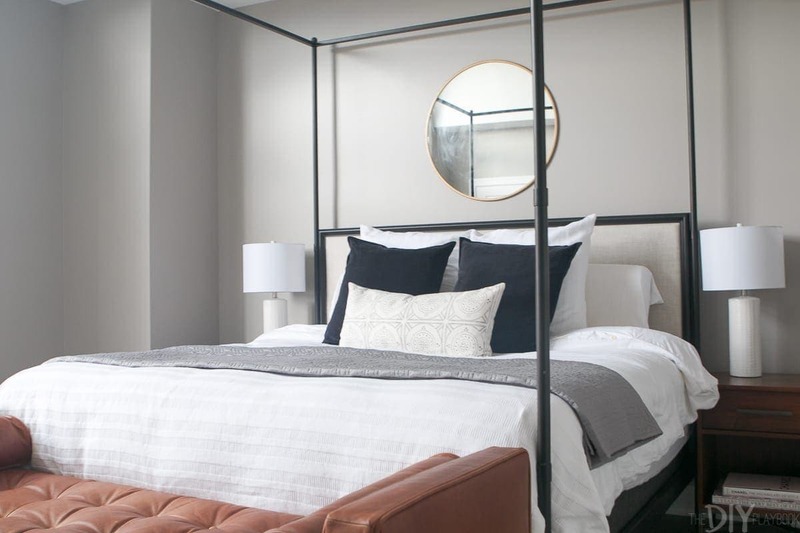 We told them we’d help them decorate their master bedroom space, and have spent the last month or so sourcing items. Today we’re back with a little progress report. 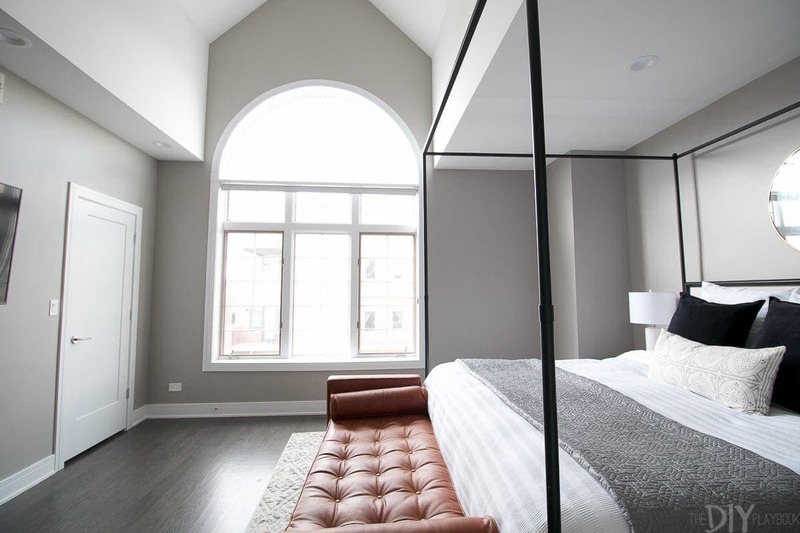 First, they chose a pretty neutral for their walls and painted them Benjamin Moore’s “Ozark Shadows”. They wanted a slightly darker grayish color, but didn’t want it to look too blue or purple. I think this color works perfectly in their light-filled space. They also added some roller shades on the windows for extra privacy. Once those 2 essentials were completed, it was time to get some furniture into this space. 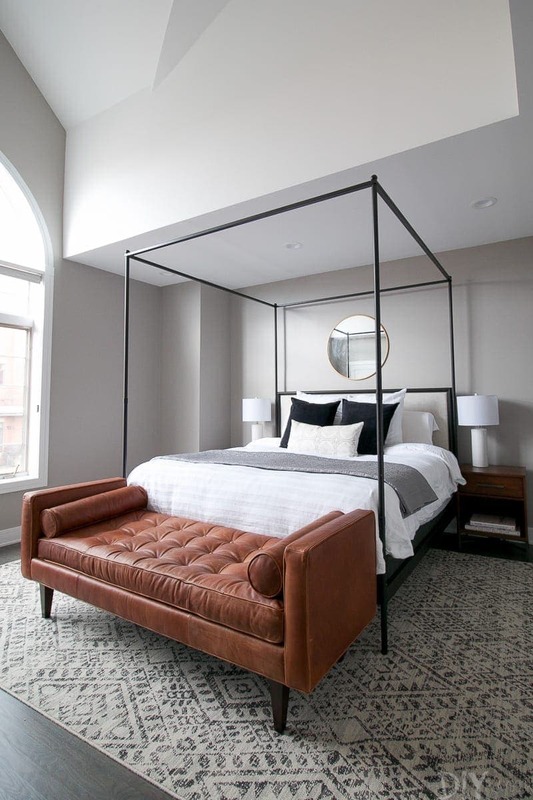 The Restoration Hardware canopy bed is a stunner and is the focal point of this space. The clean lines will never go out of style and I love how the four posts really showcase the high ceilings in this space. 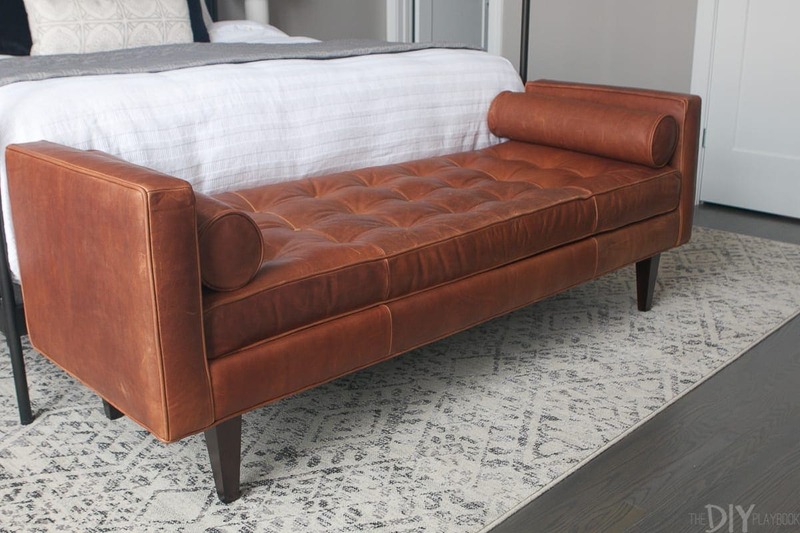 At the foot of the bed, we added this leather bench from Rejuvenation. It was a pricey purchase, but the leather feels like butter and the quality can’t be beat. 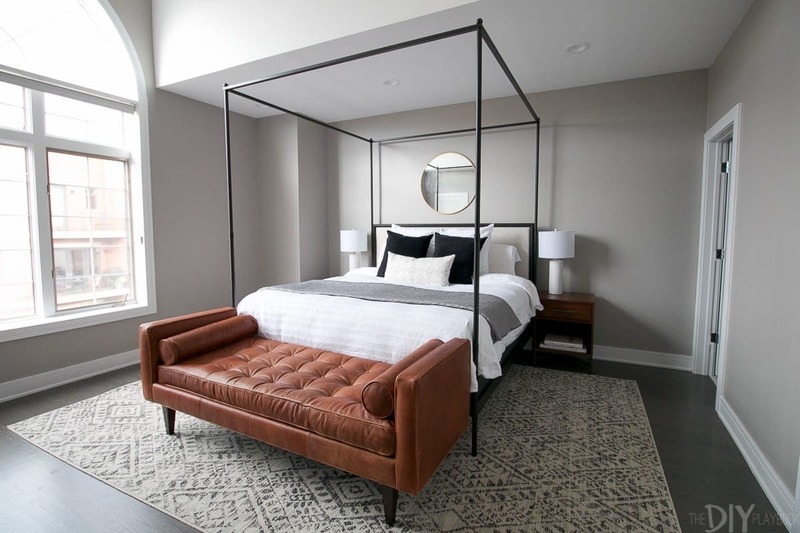 Plus it’s a great size and isn’t too puny compared to the large bed, and the brown really warms up the cool tones of the space. 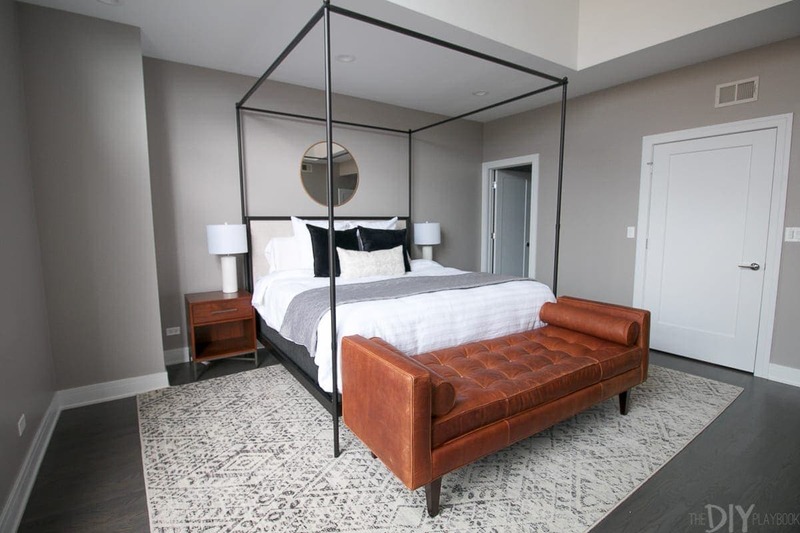 A 9×12 rug was another essential for this large space, as it really grounds the room and makes the entire space feel a bit cozier. 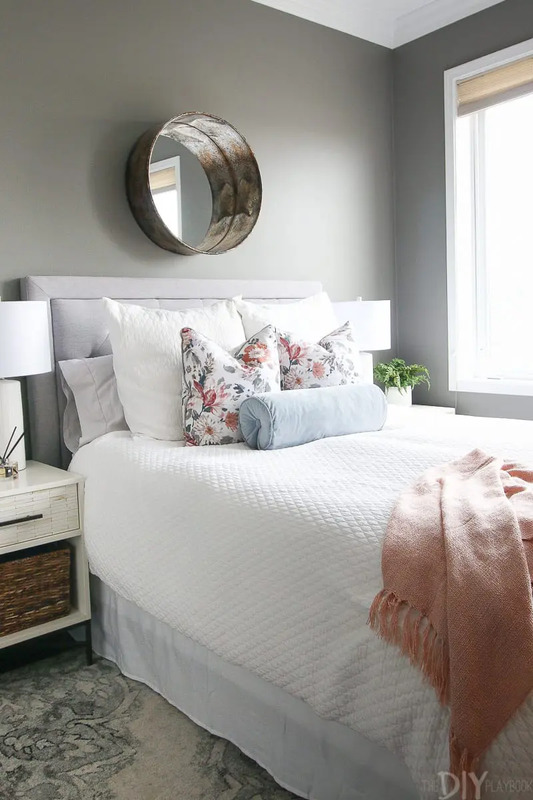 I love the neutral colors and boho vibe of this one. Plus for a rug of that size, the price was right! 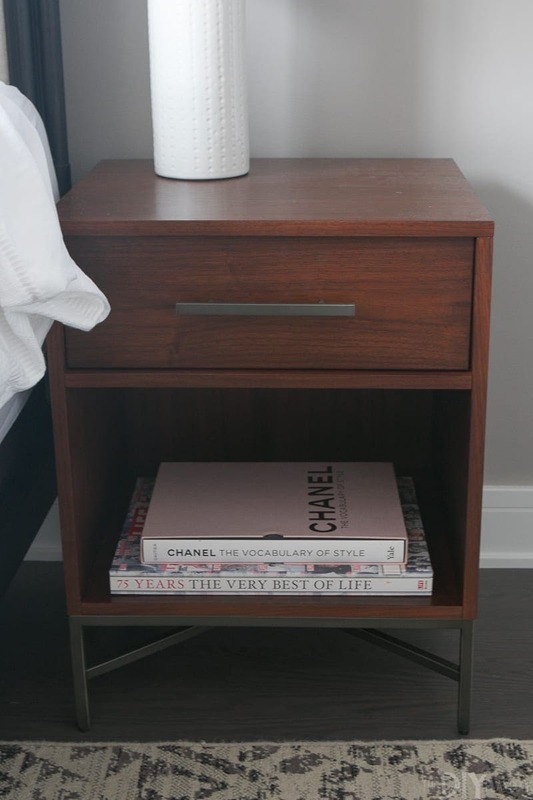 We originally had larger nightstands planned for the space, but we then realized that the one on the right side of the bed was going to interfere with the access to the master bathroom. So we had to opt for smaller ones (that weren’t our first choice). I think they still work for the space, and Ryan & Sarah are happy to have some extra storage and a spot for items next to their bed. 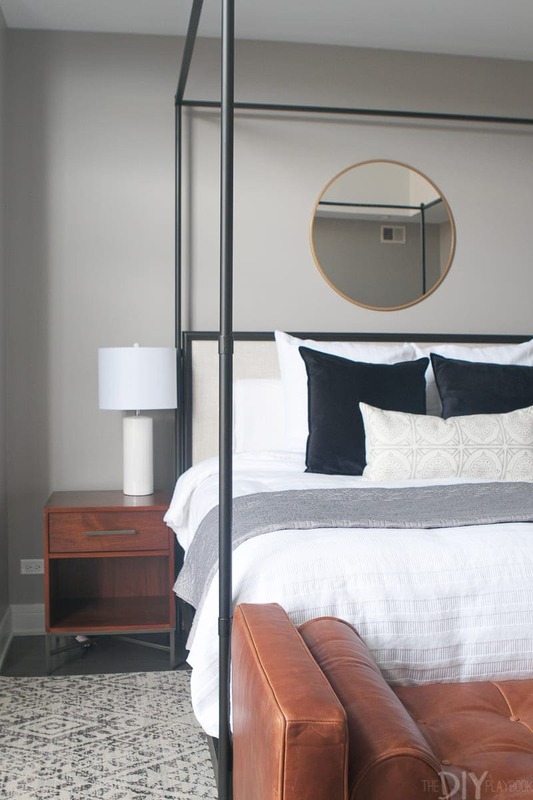 The bed styling is still being tweaked, but we did add a few pieces on there. First, we urged them to buy our favorite white duvet from West Elm. They went with this one and the texture on there is modern and simple. As for the pillows we currently have 2 large euro shams in the back, but are considering adding one more. This is our first time decorating a king bed, so we’re feeling a bit out of our element with the amount of pillows! 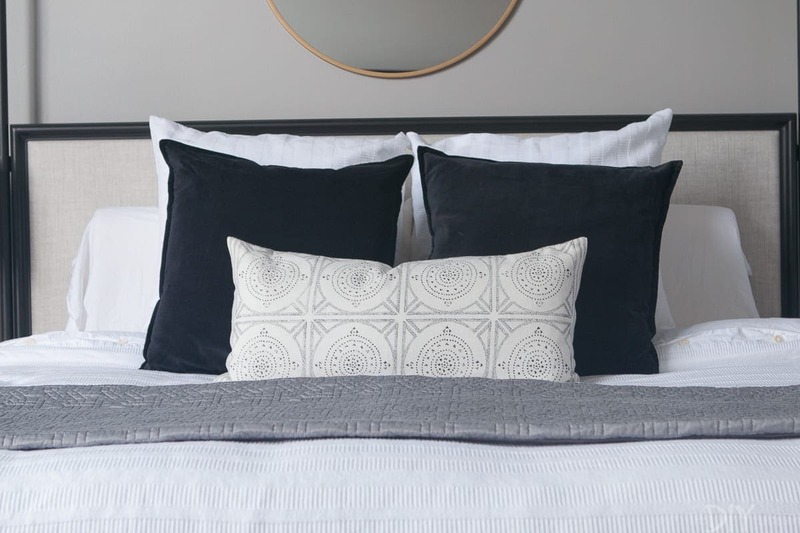 In front of the euro shams we added these 2 black velvet pillows (so luxurious) and a patterned lumbar. We went back and forth with a lot of throw pillow combos, but I’m happy we ended up with this look. Very chic and modern. The throw at the end of the bed is actually the throw from my bed! I just brought it over to see how it would look on there. 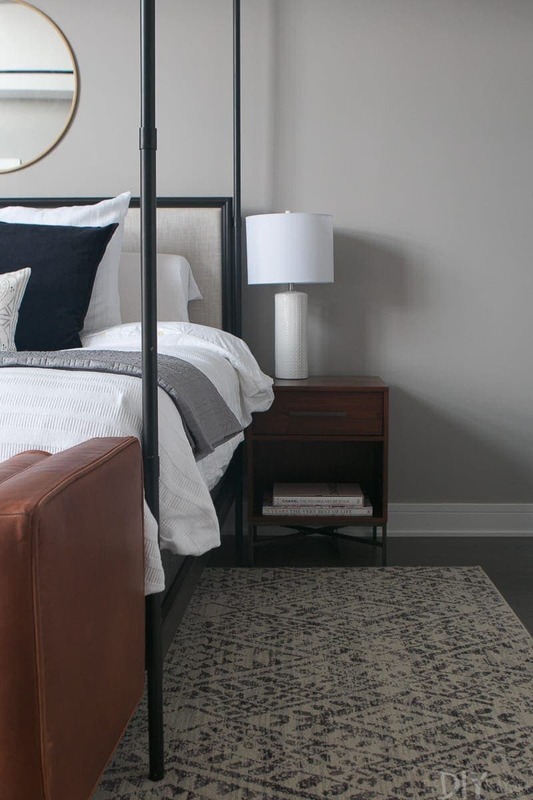 I think the gray is a bit too light and it would benefit from a charcoal quilt instead. Plus mine is sized for a queen and is a bit small on this large bed. I’m keeping my eyes peeled for the perfect throw or quilt for the bottom. Over the bed we placed our favorite gold mirror from Target. 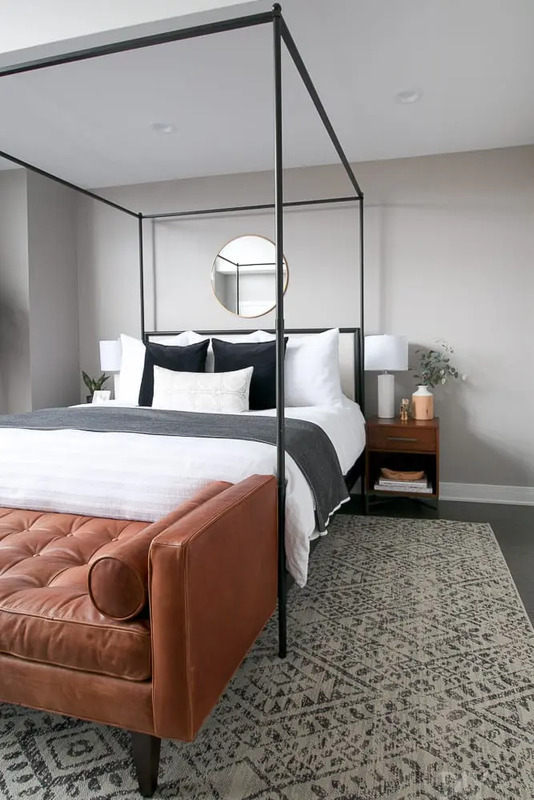 It’s such a steal and the gold tones warm up the space. We’re planning to add some more gold accessories throughout the rest of the room to match. Finally, we’ve got the lamps on the nightstands. 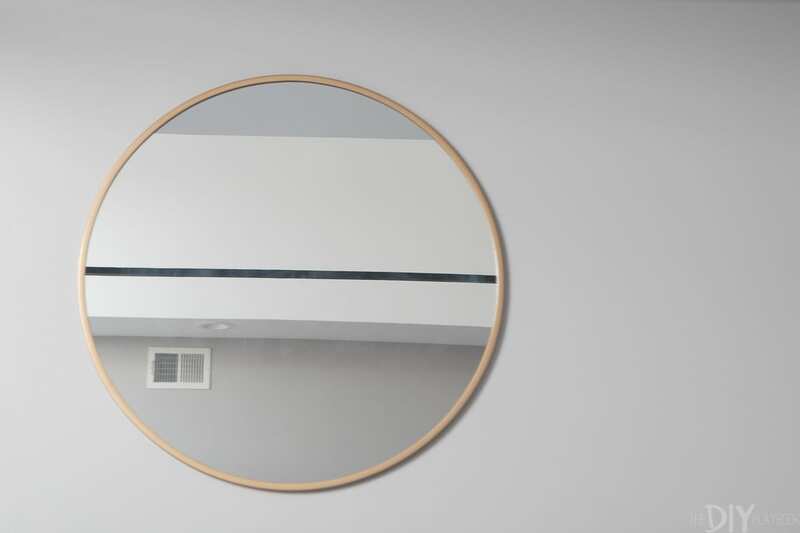 We ordered them from Wayfair and were pleasantly surprised by the quality and detailing for the budget-friendly price! 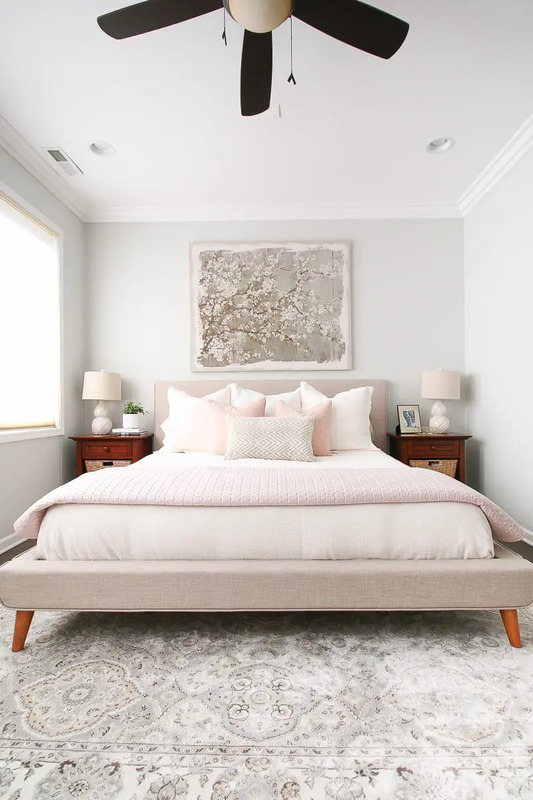 The bright white matches the bedding well, and the height is perfect next to the tall bed. The other side of the room is in need of some TLC. They mounted their TV on the wall and we have plans for a dresser underneath it. We found an amazing vintage dresser from Megmade that is currently being painted a charcoal/navy color. It’s going to look gorgeous underneath the television in here. On the left side of the dresser we’re hoping to find a large floor length mirror. Not sure if we want to do metal or wood…we’ll see what we can find. With all of those major pieces in place it will be time for the fun stuff…plants, wall art, accessories! We don’t want to go overboard in here, because we do think the minimalistic look works really well in a modern space like this. 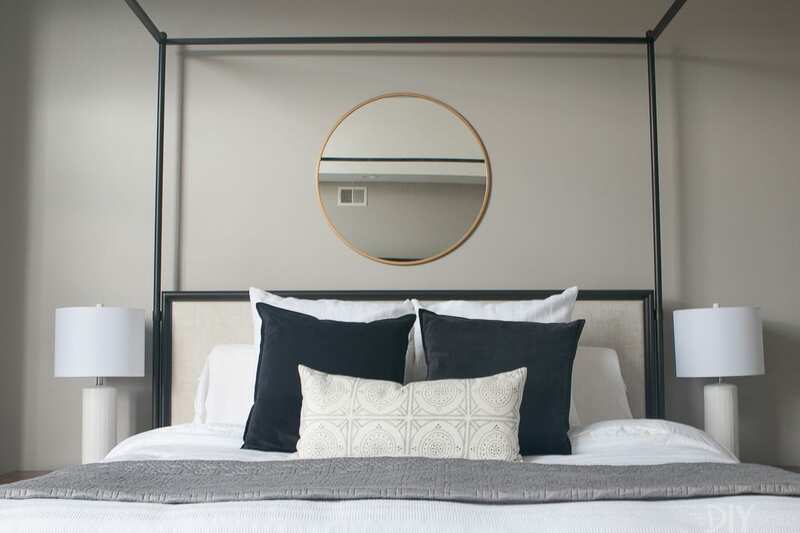 But we will add some personal touches to really bring the entire master bedroom to life!